What are Proper Food Portions? Eat 5 serving of fruits and vegetables, eat in moderation, and don’t overeat. These are all things we have probably heard repeated over and over. That’s all fine and dandy, but what exactly does eating in moderation mean? What does a serving look like? And how do I know if I am eating too much? First off, we’re going to throw out the old ‘eat this many servings’ thing because it has only brought confusion. The USDA is now going by cups and ounces to show what foods and how much of them we should be eating. Below is a daily breakdown of recommended macronutrient intake. People of different ages and genders will require different quantities of nutrients. Click on the age groups to see the USDA recommended nutrient intake. For the USDA’s explanation and breakdown, please go to choosemyplate.gov. The second issue we come across in nutrition is that people consistently underestimate the number of calories they consume in a day – mostly due to not knowing what a serving size is, or how much a cup of food is. If you are keeping a food log and estimating caloric intake, chances are, you’re underestimating your calories by anywhere from 10-45%. (See article on multiple studies: http://www.theatlantic.com/health/archive/2012/03/why-calories-count-the-problem-with-dietary-intake-studies/254886/). There will always be an unknown caloric variable in food when you are eating out at a restaurant. Even if that restaurant happens to display average calories, the chef may use more or less of certain ingredients; They may add more fries or drizzle on more salad dressing. It is much easier when you cook at home because you know exactly what ingredients you have added to your dish. We don’t need to become obsessive about counting every calorie -it would take far too much time, and is nearly impossible to be completely accurate. 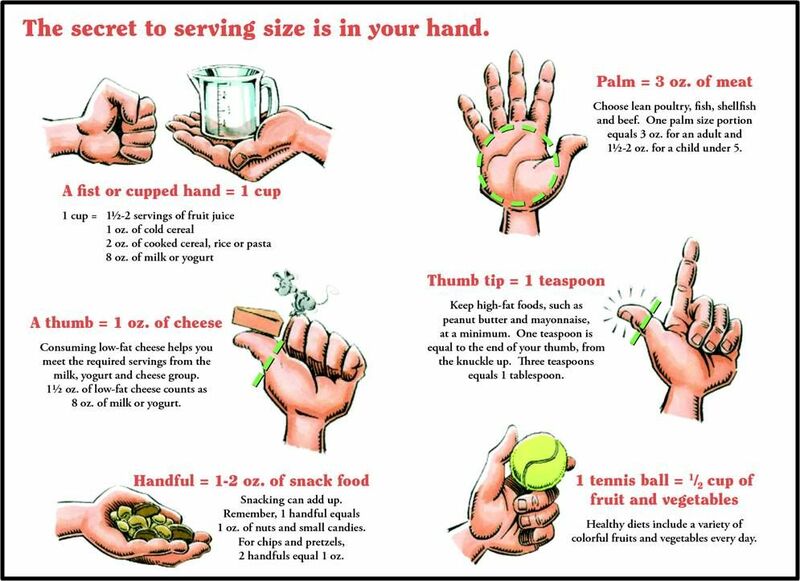 It does however, help when we have a better understanding of food portions so that we can practice that whole ‘moderation’ thing. 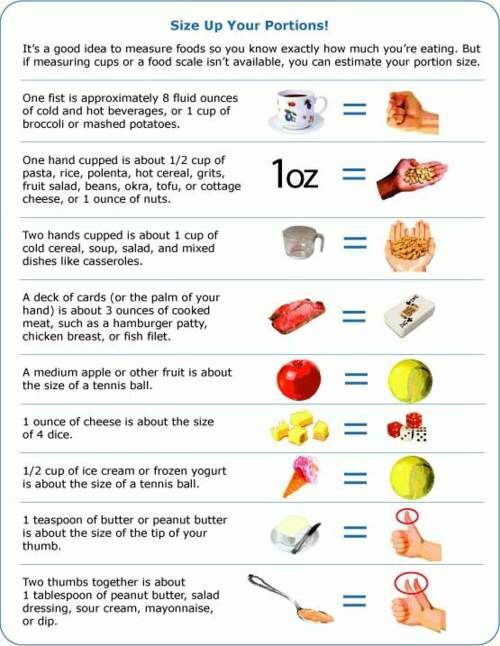 I find that the best method to understanding portions is to make a visual comparison to other common objects. Below is a number of comparison pictures that will give you an idea about portions. Use these guidelines, and try to get all of your daily nutrient requirements. *These pictures are not mine, and I could not find their origin, if you own these pictures and do not want them displayed here, please let me know and I can remove them.